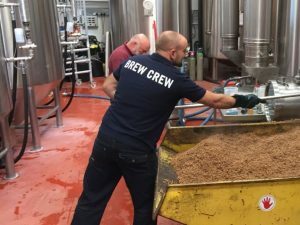 Brewer for a Day is back! The perfect experience for up to two beer lovers and those with an interest in beer and the brewing process, starting at just £80 per person. Join the brewing team for a day at Westerham Brewery and enjoy a minicask of a beer of your choice to take home the same day, or return for a minicask of the beer you brewed. Please note: as we do not brew on Fridays or Saturdays, Brewer for a Day bookings can only be made Monday-Thursday. This is one of our most popular gifts, vouchers available. Please contact the brewery to purchase this unique experience and book a date on 01732 864427. What a tremendous day I had yesterday being a ‘brewer for the day’. I had no idea of the amount of work and the intricacies behind making beer. Having been very hands on and successfully produced 5,132 litres of Spirit of Kent I now know a lot more! Gordon and Nat were brilliant and got me involved and working hard. Thankfully I’m very used to using electric scales so the large amount of hops measuring out was not a problem. The whole team made me feel very welcome and the breaks in the staff room were most amusing! Good tea as well…. I have to say I am hugely impressed by the whole set up at Westerham Brewery and can understand why Robert is so proud of being the owner of Kent’s 2nd biggest brewery. A brilliant day and highly recommended for anyone who has an interest in the arts of brewing delicious beers.